The first co-op grocery store of it’s kind in Dayton is on a mission : to serve those who live in the Northwest Dayton Food Desert. 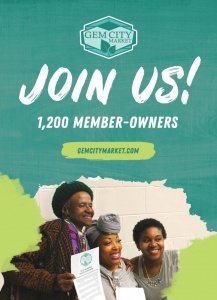 The Hathaway Group was thrilled to be engaged by The Gem City Market to develop a marketing strategy and execute it over a period of 16 months. The work we did for Gem City Market was a collaboration between their incredible group of volunteers, dedicated staff, and our team. The product of this engagement was a strategic marketing plan which could be executed by engaged volunteers and staff, a fully functioning website which can be edited by GCM Staff (THG aided the build undertaken by Jetpack), an engaged and informed social media community, a roaring success of a Capital Campaign, and a brand image that can be replicated and exploited to the benefit of the Gem City Market and those they serve. The end game for The Hathaway Group over the 16 month engagement was to develop a situation for marketing outreach that could be replicated and carried out by staff members and volunteers. There was some challenge in putting the right people and enough people in place for an undertaking like this; but there was no challenge in finding people who wanted to engage and wanted to help this organization. This customer was a pleasure to work with. They were continually mission focused and counted those they hoped to serve in the very near future, instead of counting dollars. We feel this was and is the key to their success.We continue to support their efforts and wish them them continued success! Click here for samples of the work we did for Gem City Market. Click here to view the brochure we developed. Click here to view graphic design elements for social media.